Win Tickets from @mizmeliz to See @TheHeatMovie See the Trailer #THEHEAT ROCKS! I was excited to see this movie as soon as I saw the trailer for it in the theater. Then I found out that I can see it for FREE before it opens at a screening. It’s a LADIES NIGHT event. If you want to attend for FREE (I don’t know why I have to capitalize the word free. I guess it is because I am yelling it and I am excited!) just read on. If you live near Sherman Oaks, CA and want to win two admission passes to see a screening of the movie on Wednesday May 29th @ 7:30PM just tell me in the comments one other movie you have seen featuring one of the stars of The Heat. If you get the answer right, and you will, I will email the details to you and make sure you and a friend are on the guest list. I hope I see you there! Good Luck! Note: You must live in the local area and provide your own transportation to the theater. These passes do not guarantee admission to the film. It is important to show up 45 minutes before the start of the screening to ensure VIP seating. Space is limited. I will post a message when all passes have been given away. Only the names of the limited eligible winners will be placed on the guest list. I have not been paid to promote this or any other film. All opinions are my own. I have been offered free admission to this screening. I have one set of movie passes left to give away – going, going, gone! 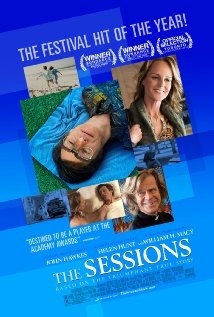 I am looking forward to seeing this new film from Fox Searchlight called THE SESSIONS starring John Hawkes and Helen Hunt coming in theaters on October 19th. There is a Special Screening coming up for the film. And I have a prize for the first ten people who reply in the comments with the correct answer to my Miz Meliz Movie Question! Miz Meliz Note: Admission is not guaranteed and this is one of those times that being “stuck in L.A. traffic” is not an acceptable reason for being late. No “fashionably late” or “Filipino Time” takers on this one, please. I really don’t want to disappoint you! So plan to be there by 7:00 PM. The first ten people who respond in the comments with a correct answer AND their email address will win. I will send you a confirmation email if you are the winner. Just be sure that before you answer, you can actually attend the screening. You must provide your own transportation. You must be available to go to the screening and you and your guest must arrive by 7:00 PM. ENTRIES FOR THIS CONTEST ARE NO LONGER BEING ACCEPTED. Due to high interest in this event, I have been asked to withhold awarding any more winners. As the producers would like to be able to ensure seating to all the winners. Calling all fans of THE CLOSER! To celebrate the end of seven extraordinary seasons of the record-breaking show, THE CLOSER, TNT and Lincoln are hosting a Series Finale Screening Event on Tuesday, August 7th. This exclusive event includes a showing of the series finale, talent appearances on the red carpet, complimentary food and beverage, and a Q&A with your favorite detectives following the screening! For your chance to win, email mizbizevents@gmail.com with the subject “THE CLOSER.” See details below. Would you like to attend this special event taking place on August 7th? That is five days BEFORE the series finale airs on TNT! This is for BIG FANS! Here is your chance to win four tickets! Just EMAIL your answer to my ‘Closer Qualifier’ question to me at mizbizevents@gmail.com AND let me know that you sent the email in the comments for this post. Your name will be entered into a random drawing. Five people will win! It’s that easy! As of this moment: ENTRIES FOR THIS CONTEST ARE NO LONGER BEING ACCEPTED. Due to high interest in this event, I have been asked to withhold awarding any more winners. As the producers would like to be able to ensure seating to all the winners. What are three things that Deputy Chief Brenda Leigh Johnson loves? There are many answers and all will be accepted! Just send your three favorite answers in an email to me at mizbizevents@gmail.com and post a comment telling me that you entered to win on this post. One entry per email address will be accepted. The winners will be notified on Monday, August 6th – just before the next to last episode airs at 9:00 PM Pacific Time.